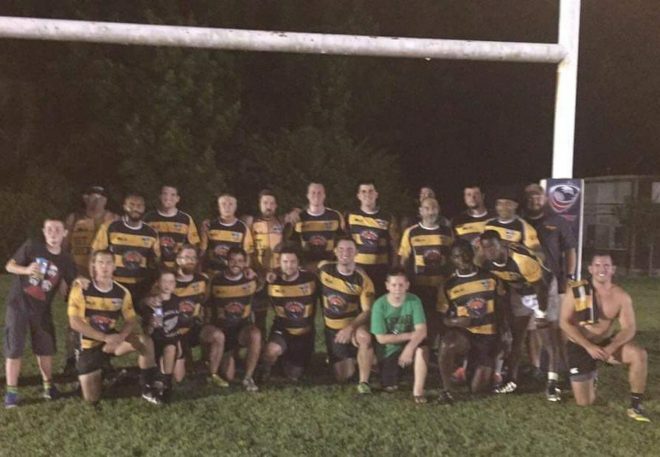 RALEIGH, NC – On Saturday night, the Bootlegger’s 7s squad made the short trip to Raleigh to take part in the Moonshine 7s hosted by the Raleigh RFC. Last season, the men from Clayton won the Bowl competition at the tournament. After a confident start to their 7s season, the Bootleggers looked to improve on their finish at last year’s event. They did just that as the Bootleggers finished second in the tournament after falling in the Championship to the Rattlesnakes Alumni team. The Bootleggers opened up pool play with a narrow 17-12 victory over New Bern. Matt Aronowitz scored two tries to lead the offense. DJ Johnson scored and converted a try to close out the scoring for the squad. Next up, the Bootleggers took on a team of Raleigh Backs, dubbed Tan & Handsome. The Bootleggers used a stout defense to keep Raleigh in check and they pulled out a 19-7 win. Nick Russell, Connell Smallwood, and Brendan Fitzpatrick each added tries for the Bootleggers with Russell and Fitzpatrick adding the conversions. The Bootleggers finished pool play by taking on NC State to determine the top seed coming out of pool play. Clayton struggled to maintain shape as they fell to the Wolfpack 24-17. Even after the loss, the squad’s two earlier wins were enough to put them into the semifinals where they, once again, faced off against NC State. This time around, the Bootleggers found their groove as they got revenge on the Wolfpack with a 24-10 win. Gareth Davies, Chris Crumity, Johnson, and Aronowitz each scored tries in the semifinal victory. The win placed the Bootleggers in the Championship against a talented Rattlesnake Alumni team. The Rattlesnakes came out and pushed the tempo of the match early. They took the lead and the Bootleggers were left to chase a lead that they never caught as the Rattlesnakes took home the Championship. Overall, it was another solid showing for a Clayton 7s side that is slowly developing into a consistent performer among 7s sides in the Carolinas. The Bootleggers continue their 7s season with a number of tournaments lined up in July, including the 2nd Annual CottonTown 7s hosted by the Clayton RFC. Stay tuned for reports as the team continues their season and pushes to bring more hardware back to Clayton.